Rue Jean Jaurès 45, 92800 Parijs, Frankrijk. The Hotel Le Dauphin***, a convivial and charming hotel, welcomes you all year round for your touristic and business trips. 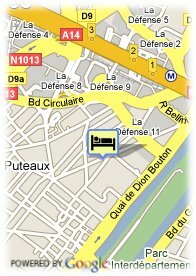 It is located next to the business centre La Défense and about 10 minutes from Paris by metro. Each of its 37 rooms is gently personalised with its diffusing perfume lamp. You can choose one of the five fragrances when you make your reservation: the natural touch, the tonic, the relaxation, the gourmand touch or the sensual touch. The buffet breakfast is an extreme refinement and it is a pleasure to see and taste it. On sunny days, you can even enjoy it in our small garden. Start your day with energy and conquer the Parisian days! You will be welcomed by our warm team who will do their best to make your stay as memorable as possible. 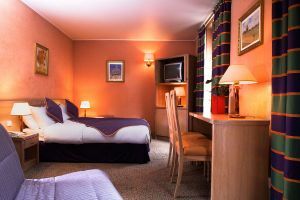 We look forward to helping you discover the Hotel Le Dauphin with all of its advantages! dichtbij beurscomplex, dichtbij metro / tram, dichtbij winkelcentra. Breakfast is served every morning in the reception hall, in the form of a buffet. A wide choice of products is available: croissants, breads, yoghourts, coffee, tea, cooked meats, cheeses… When the weather in fine, breakfast may be taken on the patio where you can enjoy the sunshine and flowers. It can also be ordered in the room, served in the form of a picnic basket. Room Service is uniquely at noon and evenings.